NASC HAS CONDEMNED eviction letters issued to asylum seekers living in direct provision in Ireland recently, claiming that it is “one of the most inhumane actions we have ever seen” by the Department of Justice. The migrant and ethnic minority support agency said that the Reception and Integration Agency (RIA) of the Department of Justice is “actively seeking to make asylum seekers homeless and destitute”. The agency said that RIA is issuing the letters to certain single, male asylum seekers who are on deportation orders, that they must vacate direct provision by a certain date. TheJournal.ie understands that Nasc recently became aware of around seven people issued with these letters since the start of September. The asylum seekers in question have been on deportation orders from the State for several years, often from countries that Ireland could not deport to, such as Palestine and Somalia, according to Nasc’s legal services manager Fiona Hurley. Hurley condemned the eviction orders, saying that up until now, RIA has housed asylum seekers on deportation orders, “some for upwards of seven or more years”. “This letter shows a catastrophic shift in policy, which will actively make those on deportation orders that have not been affected by the State at severe risk of homelessness and destitution,” Hurley said. Asylum seekers – including those on deportation orders – have no entitlements to social welfare, so they cannot access homeless services. In addition to this, once a person vacates the direct provision system, they are no longer entitled to the €21.60 per week Direct Provision allowance. In a statement explaining the decision, the Department of Justice said that it is “incumbent on those with deportation orders to remove themselves from the State”. “It is an integral part of the immigration regime of all developed States that those who have been given due process and have been determined to have no right to be in the State should remove themselves, or if failing to do so, be forcefully removed,” the statement said, adding that it was “unreasonable to expect that persons with deportation orders can continue in State provided accommodation indefinitely”. In a statement today, Nasc said that it has been the Department of Justice’s position up until now that direct provision was established to ensure that asylum seekers would not be destitute or homeless in the State. “These people will be left entirely destitute, without access to housing,” Hurley said. “Across the board, people who are pushed into homelessness have difficulties accessing services. Now imagine a scenario where you have a person without a residency permission, without entitlement to supports, without even any identity documents, with cannot return to their country of origin, on the streets because the State has decided it is no longer willing to support them. “Whether they like it or not, the Department has a duty of care, to provide housing to people who have claimed asylum and who seek accommodation from it until such time as those people are either granted asylum or subsidiary protection, granted leave to remain or leave the country voluntarily or by deportation,” she said. It remains unclear why the asylum seekers in question have been issued with eviction orders. 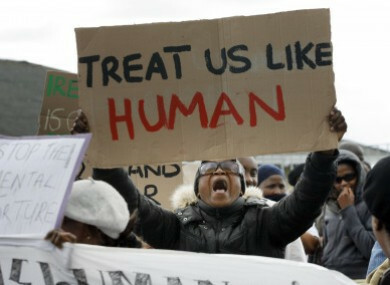 Email “'An inhumane action': Eviction orders issued to asylum seekers in direct provision”. Feedback on “'An inhumane action': Eviction orders issued to asylum seekers in direct provision”.